MyndFood: Will Backflip for Food! Alexis is, without question, my daughter. Saturday (after going to bed very late Friday evening-we sang at a special event), we woke up early (too early, if you ask me), and piled into cars, and made the haul, with a group of teens and young adults from church, to San Francisco. A whirlwind day: BART ride from Pleasanton into 'Frisco; an immeasurable time shopping at Union Square; a cramped bus ride across town to Pier 39 and Fisherman's Wharf; a boat ride (for some in the group), Ripley's Believe it or Not museum for others; a nice dinner at Rainforest Cafe. Then a limo ride across town, BART ride back to the cars, and a VERY difficult drive back home. 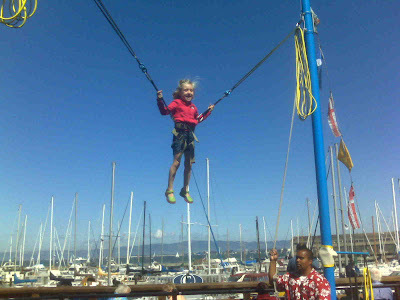 At Pier 39, Lex decided that she wanted to try out some bungee-trampoline contraption that they had there; and she wanted me to go too! So, we did! She's unbelievable! A miniature trapeze artist! The guys running the thing taught her how to do backflips-she thought that was cool! So she did backflips! And then it was my turn. I couldn't get the backflips quite right. The guy running the thing asked if I wanted my daughter to come teach me how. So, I redoubled my efforts. And finally got it down toward the end. 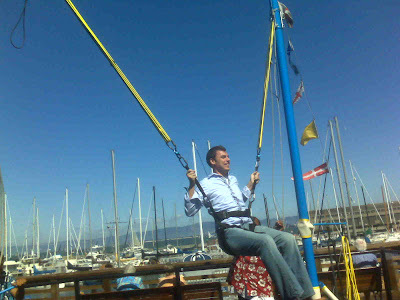 Lex and I contacted Ringling Bros. today about a part-time gig as trapeze artists. They accepted her, but she told them that her dad was part of the package; we go together. I love that girl! They ARE bell bottoms...What's HAPPENING?????? Boot Cut...they're called BOOT CUT folks! A FAR CRY from bell bottoms. ...I DO look good in them though, don't I? BOOT CUT...FLOWERED SHIRT...FRISCO....AND in love with your self ?!?!?!?!?!?!? !